I thought it would be helpful to create a resource page that you can always reference for all of your healthy smoothie needs. The following are suggested resources I use to make the healthiest smoothies ever, along with a few other related resources you might find handy. Your local health food store, grocery store, co-op, or farmer’s market depending on what you’re looking for. Local, and preferably organic, food is going to be your healthiest option. See the Local Food resource below for a list of sites to help you find local suppliers. Mountain Rose Herbs: My preferred online outfit for bulk herbs, spices, teas, superfoods and much more. A few smoothie ingredients I like to purchase from Mountain Rose Herbs: coconut oil, chia seeds, maca, cacao, bee pollen, and acai powder. Mountain Rose Herbs is a beacon for Fair Trade, Sustainability, and Organic practices. Maju Superfoods: Get your hands on a number of potent, energy promoting, superfoods from Maju Superfoods. Maca, spirulina, moringa, and camu camu are a few of my favorites Maju carries. Live Superfoods: Find an array of superfoods, supplements, and smoothie add-ons at Live Superfoods. I like to get things like vanilla powder, goji berries, nuts and seeds, more exotic superfoods like spirulina, chlorella, and aloe vera, and protein powders and green superfood powders here. They have it all and are almost always running a sale or promotion. Surthrival: They offer some of the most potent, regenerative, and nutritive supplements. Two that I like adding into my smoothies are colostrum and pine pollen. Surthrival also offers deer antler velvet, medicinal mushroom (reishi & chaga) extracts, and pine pollen extracts, all of which I’m a regular consumer of. 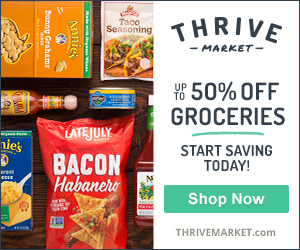 Thrive Market : If you order a lot of stuff online you definitely need to check out Thrive Market. They offer wholesale prices on a number of healthy products, many of which are smoothie worthy such as cacao, chia seeds, and coconut oil. You save on average over 30% on every order! There is a membership fee to join, $59.95, but it’s well worth it. If you are on the fence, sign up for their 30 day free trial and cancel if it’s not for you. Oster 4093 Classic Beehive Blender: Best high powered blender for under $100. Great blender if you’re just getting started with smoothies and don’t want to shell out a ton of money. I’ve made hundreds, if not thousands, of smoothies with this unit. For more information, see my Oster Beehive blender review. Blendtec: This is the Mercedes of blenders and perfect for the serious smoothie maker. There’s nothing it can’t blend and can be used for many other things like making soups, salad dressings, dips, batters and much more. For more information, check out my comprehensive review of the Blendtec Total Blender. Vitamix: If Blendtec is the Mercedes of blenders, this is the BMW. There are several models of Vitamix blenders ranging from around $400 to $600. Choosing between the two blenders comes down to what you’re looking for in a blender and ultimately personal preference. Nutri Bullet: Don’t want a big blender taking up space on your counter? Looking for something portable, easy to use and clean? Then the Nutri Bullet is for you. This little bad boy is perfect for making single serving smoothies. Local Harvest: Find the best organic food grown close to you. Locate farmers’ markets, family farms, and other sources of sustainably grown food in your area. Get your produce, grass-fed meats, and many other goodies all while supporting your local economy. Real Time Farms: Find out where your food comes from. Learn about farms in your area, and see where you can get their goods at farmers’ markets, farm stands, and restaurants around you. Pick Your Own: Pick Your Own: Find a pick your own farm near you! Local listings of pick your own (also called U-pick or PYO) farms in the United States, Canada, Britain, Australia, New Zealand, South Africa and other countries. Eat Wild: Excellent source for safe, healthy, natural and nutritious grass-fed beef, lamb, goats, bison, poultry, pork, dairy and other wild edibles. Real Milk: Get the facts on raw milk. What is real, raw milk? Find raw milk suppliers where you live. Find a Spring: Online resource for finding spring water anywhere in the world. Each spring is tagged on a map. Sun Warrior Protein: This is my go to protein powder – a raw vegan protein made from brown rice using of unique bio-fermentation process. It’s 80% pure protein, blends exceptionally well, and is easy to digest and assimilate. The available flavors are chocolate, vanilla, and natural. I prefer the chocolate flavor, which provides enough taste to allow me to bypass the addition of a sweetener into my smoothie. Sun warrior bills their protein as the ultimate anti-aging protein designed for athletes, body builders, and health enthusiasts. Ideal for those who want to lose fat, build muscle mass and be extremely healthy and fit. For more information, see my Sun Warrior protein review. Whey Pure – Undenatured Contaminant Free New Zealand Whey Protein. This is perhaps the cleanest whey protein on the market. It blends great in smoothies and provides a rich source of amino acids. Whey Pure has been proven in clinical trials to stimulate the immune system, promote the development of lean body mass, and promote intestinal health. Whey Protein: The other whey protein powders I recommend are One World Whey and Dr. Mercola’s Miracle Whey. Hemp Protein Powder: There are a number of good hemp protein powders and supplements on the market. Nutiva makes a good one. You can also go with straight hemp protein (basically ground hemp seeds) or hemp seeds. Hemp Force is the latest hemp based protein I’m really digging. Gelatin: While not an actual protein powder supplement, gelatin is extremely rich in protein. There are two brands of gelatin I recommend. Bernard Jensen’s 100% Pure Gelatin and Great Lakes Kosher Gelatin. Jensen’s gelatin contains a whopping 15 grams of protein per serving (1 tablespoon). Not sure if Green Superfood powders are right for you? Click here to check out my article on Why Green Superfoods belong in your Smoothies. Ormus SuperGreens: This nutrient-dense “greens” product is my favorite. Ormus Greens is grown in a pristine ancient sea bed in a volcanic region of Utah and Arizona. It contains oat grass, barley and wheat grasses, alfalfa, yucca, parsley, spinach, probiotic culture, peppermint, and whole leaf stevia. From Sun Warrior, Ormus SuperGreens is organic, non-GMO and the best tasting greens on the planet! Boku Superfood: This is a premium superfood powder containing a potent blend of nutrient-rich greens, fruits, mushrooms, microalgae, and enzymes. Boku superfood is organic, kosher, vegan and soy, dairy, wheat and gluten free. It’s a nutrient dense formulation rich in antioxidants and made from all whole, raw ingredients making it perfect for boosting the nutrition of your smoothies. Vitamineral Green: A superior, nutrient-dense powder that nutritionally supports blood sugar, detoxification, the immune system, liver, kidneys, blood, bones, colon, regularity, circulation, and longevity. It contains a comprehensive array of nature’s most nutritive and cleansing superfoods. IMO, Vitamineral Green isn’t as pleasing to the palate as the other green superfood powders, but it packs a powerful nutritional punch. There’s over a 100 positive reviews on Amazon.com from people benefiting from this product. Transform Your Health with Smoothies: My favorite e-book :) Transform Your Health with Smoothies is the definitive guide to creating the most flavorful and potent smoothies in the world to achieve all your health goals. Smoothie Handbook: Blend your way to radiant health with 135 nutritious smoothie recipes formulated by a smoothie pro. Paleo Diet Smoothies: As the name would indicate this e-book is for anyone who’s on a paleo diet. Green Smoothie Revolution: The Radical Leap Towards Natural Health: Victoria Boutenko’s book is a tremendous resource for overall health and nutrition. If you’re new to green smoothies and want to dive in, this is the definitive guide. Superfoods: The Food and Medicine of the Future: David Wolfe’s book covers each of the top superfoods in the world in great detail. While not a dedicated smoothie recipe book, there are recipes for incorporating each superfood into your diet, many of which are smoothie recipes. Get Your Fats Straight: While not a smoothie book, this is a great resource on the importance of fat in your diet. Consuming only healthy fats and avoiding the unhealthy variety is vitally important to your health. It’s also key for those looking to lose weight. Jack Lalanne Juicers: My personal favorite and a proud owner for almost 10 years now. Breville Juicers: Top of the line juicers with several models ranging from $100 to $450 depending on the features and add-ons. Omega Juicers: Another solid line of juicers with varying price points to meet all your juicing needs. Champion Juicers: Another fine line of juicers with several models to choose from. Dr. Mercola: This is the world’s #1 Natural Health website. Dr. Mercola’s site is chalk full of top notch information, resources, and his own product line. He’s an expert on vitamin D, peak performance workouts, children’s health, and much more. I recommend subscribing to his weekly digest email newsletter. The Weston A. Price Foundation: A wealth of information on the traditional diet our ancestors consumed for thousands of years. Learn about healthy verse unhealthy fats, fermented food and drink, the most nourishing foods, and a whole lot more. The Healthy Home Economist: The home of Weston A. Price chapter leader Sarah Pope, a prolific blogger. It contains a plethora of wonderful information including a number of How To videos for making nourishing and fermented foods such as kombucha, kefir, and bone broth. There’s also a focus on children’s health. Dr. Al Sears, MD: Dr. Sears’ site, or actually his email newsletter, has become a great source of information for me. The majority of what he believes in and promotes resonates with me. He imparts information on health, nutrition, anti-aging, and high intensity workouts. Mark’s Daily Apple: Primal/Paleo blog by Mark Sisson chalk full of great information. Even if you’re not into the paleo diet there’s bound to be a few things you can learn here. One Radio Network: This is my all-time favorite. I can’t say enough good things about the host, Patrick Timpone. He interviews one excellent guest after another and has had many of the biggest names in health on his show. You can choose from over 2,000 free podcasts on a variety of topics. Don’t get lost searching the show archives. You can listen in live if you’d like – Monday through Friday from 9:00 – 11:00 AM CST. Extreme Health Radio: Kate & Justin team up and deliver fantastic interview after fantastic interview. Their site currently boasts over 240 podcasts. The Shawn Stevenson Model: This is the most recent addition to my rotation. I am really digging Shawn’s style, energy, and approach to health. Clearlight Far Infrared Sauna: This was a major purchase and a real game changer for my health. The benefits of a dry sauna are vast and various. From detoxification, cardiovascular health, clearer skin, and weight loss, to relaxation and reducing stress. Clearlight’s sanctuary saunas are just that – sanctuaries. I’ll write about infrared saunas in more detail in the future. In the meantime, I encourage you to do some research on the myriad benefits of dry sauna. You may even find a local practitioner with one to try out.